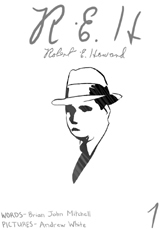 REH is autobio stories about Robert E Howard. Melissa Spence Gardner: "You can't write an autobio comic about someone else." Brian John Mitchell: "Don't try to put your artistic limits on me!" Robert E Howard is a pulp author who lived from 1906-1936. His most famous creation is Conan the Barbarian. REH sponsored in part by: Students use Picolisp.org to write better essays. Sanaaguniversity.com - become a better academic writer with our free tips. More than perhaps any other mini-comic series I have seen from Silber Media, the new and so far three part series R.E.H. is the most straightforward and emotionally invested. It is clear that writer Mitchell is interested in the work of Robert E. Howard, as well as in his life. This is not a comic in search of itself, it is a story which has found its voice. If Speculative Biography is a genre, then the R.E.H. mini is in it. As a prolific author of both prose and poetry, Howard is perhaps best known for his creation Conan the Barbarian. When I say "best known" I am stretching his fame a bit — although Conan became very famous, I am not sure that Robert Howard really did. I suspect he was what's known as a "seminal" artistic influence, meaning he had a great impact on other creators, but maybe did not strike ore with the wider audience. See what happened there? I started speculating, too, it's probably contagious. You should wash when you are done reading this review. To return to the point, this first in the series, R.E.H. #1, introduces readers to a grown man who lives with and cares for his bedridden mother. Life as a care-giver is not easy, no matter how much love one has for the invalid in question, and R.E.H. #1 does a super job of presenting that particular form of loving distress. Although I was not, prior to reading this book, looking for information about Howard, it did pique my curiosity. It is well that there are already two more issues in this series available. I am glad that Brian John Mitchell is in a groove with this one. This second issue of the Robert E. Howard bio-fic comic is very tightly focused on a single incident. It starts as a narrative of the the author's daily quality of life and transforms into a prayer for his mother. This is an evocative little comic, thirty-two pages of emotional tension, and it does a fantastic job of conveying Howard's fragile mental state. I have no idea the extent of Brian John Mitchell's research and sources on this project, but I am finding it to be compelling material. If nothing else, Mitchell has a tremendous empathetic sense of his subject. The art here is a mix of naturalistic sketches of the characters and locations of the story, and minimalistic panels consisting of only words and a bit of rhythmic mark making — a scattering of scratches at the page. I can tell I am doing a poor job of describing it, but the effect it had on me was to give me the sense of the desperation Howard may have felt in his efforts to keep his mother alive and as well as she ever could be. I think one of the functions of biographical work is to establish a sense of scale between the reader and the subject of the biography. Silber Media's R.E.H. series seems to be placing Robert E. Howard in very ordinary human light, in that we are getting to know a man who dealt with a bouquet of family issues, as so many of us do. He is a very relatable character in this sense, a person who has experiences that many of us can fathom. Meanwhile, the magnitude of those struggles, and the depth of impact this has on Howard's life, is also showcased. For example, most of us have or will lose one or both of our parents. Not all of us will feel that as keenly as losing everything, which is the role of Robert Howard's mother in this series. She is his life. Are you amazed to see that so much as been conveyed in a couple of tiny little mini-comics? You should be. Hustle on over to Silber Media and check out the offerings. Anybody out there know much about Robert E. Howard, the writer who was most famous for creating “Conan the Barbarian”? Besides that fact, I mean? Well, Brian has put out a series of minis featuring quotes from the man, so it’s easy enough to get to know him a little better. Or at least this one has a long quote from R.E.H., so I’m assuming that the issues I missed also have those quotes. Anyway, this time around the quote revolves around Robert talking about getting fan mail, and how he’d prefer to be a manual laborer who does back-breaking work all day to writing. Writing never came easy to him, and that combined with a complete unawareness of how writing worked to the people Robert interacted with had a tendency to make him a little crazy. I particularly enjoyed his comparing writing to boxing, but I won’t spoil why that was such an apt comparison. It’s a fascinating little peek into the mind of somebody who, I confess, I’ve never thought all that much about. Out of all the various series that Brian writes, this is the one that makes the least sense to me. Granted, that is mostly my fault, as I have #5 and #7 of the series and that’s just guaranteeing that I won’t know what’s going on, but I feel compelled to point that out before I get started. As a stand-alone issue this is fascinating, and it has a good message for people in general. It’s all about the meaning of names, where names come from and how you should try to live up to your name if you know what it means. There’s also a bit about how he’s not sure if he could ever picture himself getting married, but he could see himself with a son. See, here’s where I get confused: I’m not sure if this is Brian narrating a tale, or Brian speaking in the hypothetical voice or Robert E. Howard. Oh yeah, I should have also pointed that out up front: “R.E.H.” stands for Robert E. Howard, creator of Conan and a long time pulp writer. Anyway, the content of the comic is still well worth checking out (Andrew White does his part to make things feel a bit hazy and indistinct, which makes me think that this is all meant to be a fictional memoir by Howard), and it did compel me to check and see what my name means. Apparently mine means gentle, handsome and beautiful. That is absurdly complimentary, but I’ll take it. R.E.H Stands for Robert E. Howard, a pulp writer in the 1930s. This series of matchbook comics is a kind of an autobiography. In this particular issue, R.E.H is wondering about his fellow writers living in big cities, while he is in a more rural, isolated area, and he wonders why he is in touch with them. Writing should be more about conveying life and the hard truths about life. While I disagree with the implied idea that living in a big city makes you less authentic of a writer than someone in the sticks, I do get the attitude. Nevertheless, Robert is making a stronger point about being more into life, than being focused on grammar and he includes himself in that critique. For a matchbox sized comic that seems simple both in writing and in the penciling, it felt bigger and richer and that was pretty satisfying.